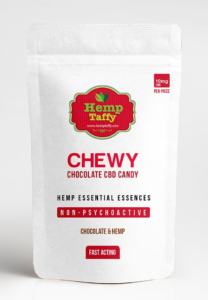 Hemp Taffy® brand Chocolate CBD edibles are made from CBD Essence® food grade CBD Hemp Oil and made into proper products all grown without thc or pesticides. 100% Safe, Non-GMO, Full-Spectrum Active Constituent-Rich CBD Hemp Oil Botanical Extracts infused into a wholesome old style chewy candy. Delicious Old style taffy made like the chewy AngelMint then infused with CBD only hemp oil for increased health effects. CBD hemp extract feeds the body’s deepest primal systems. Hemp infused cbd products are healthy and wholesome; a complement to a good health regimen. Enjoy essential oils for a refreshing aromatherapy occasion or palliative care.